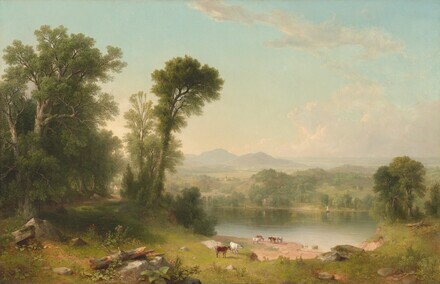 By 1861, when Asher B. Durand executed this large and impressive picture, he had fully perfected his approach to landscape painting, creating idealized, expressive views of America's wilderness based on close observations of the natural world that stand as prime examples of the Hudson River School aesthetic. Because virtually nothing is known of Pastoral Landscape's history prior to 1980, the painting's original title remains the subject of speculation. But certain relevant facts can be established. First and foremost, the work is the largest, most ambitious, and most accomplished of Durand's paintings from 1861, representing a substantial commitment of time by the artist, who was not a fast worker. Second, the scenery resembles that of the Hudson River Valley, where he spent considerable time and from which he drew inspiration for many works. Third, the painting contains several works of architecture—an Italianate villa just beyond the woods at left, an arched stone bridge, a gabled house across the water, and an English Gothic revival church in the center distance—that may or may not indicate that Durand sought to depict a specific, identifiable place. And finally, in certain respects—mostly notably, the presence of a house nestled in the woods, a church, and an arched bridge— Pastoral Landscape bears a strong resemblance to Durand's important work of the previous year Sunday Morning (New Britain, Connecticut, New Britain Museum of American Art). Regardless of its precise identity, the painting is unmistakably one of Durand's grandest and most successful panoramic renderings of an idealized American landscape. Possibly B. F. Gardner, Baltimore, by 1862. Private collection, Switzerland, until 1980; (sale, Sotheby's, New York, 25 April 1980, no. 17); (Alexander Gallery, New York); sold 1980 to Richard Manoogian, Grosse Pointe, Michigan; gift 1991 to NGA. Gardner's possible ownership is discussed by Franklin Kelly in the systematic catalogue entry on the painting (Kelly, Franklin, et al., American Paintings of the Nineteenth Century, Part I, Washington, D.C., 1996: 144-148). According to Holly Goetz of Sotheby's, New York (memorandum of phone conversation, 24 June 1993, in NGA curatorial files), this individual is deceased and those administering the estate refuse to divulge any information whatsoever about how and when the painting was acquired. The Hudson River School: Congenial Observations, Alexander Gallery, New York, 1987, no. 5, as View of Kingston, New York. The support is a medium-weight, plain-weave fabric that has been lined and mounted on what is presumed to be the original panel-back stretcher, which has two vertical crossbars and mitered joins. The ground is pale rose and has a pebbly texture, both of which affected the final appearance of the painting. This is particularly noticeable in the clouds and the sky, where the ground remains very visible. The paint was applied in layers with considerable texture, impasto, and strong brushwork. There are, especially in the greens of the various areas of foliage, many obvious pentimenti, areas of dried impasto beneath upper layers, and extensive drying cracks, all of which indicate the artist reworked the image considerably. On the whole, the painting is in good condition, with only minor areas of inpainting. The varnish has not discolored. Kelly, Franklin, with Nicolai Cikovsky, Jr., Deborah Chotner, and John Davis. American Paintings of the Nineteenth Century, Part I. The Collections of the National Gallery of Art Systematic Catalogue. Washington, D.C., 1996: 144-148, color repro.